During our Europe trip, the Czech dinner we had had was the best dinner on the whole tour so we decided to give this Czech restaurant a go. It was a small family restaurant which offered breakfast, lunch and dinner. As we walked into the restaurant, I could see the European vibe with rusty and medieval decoration. There was a beautiful light hanging from the ceiling with a map of the old world. We chose the table next to the window. The waiter came with menus and glass of water for us. The menus looked old fashioned, printed on brown paper and clipped together on a board. 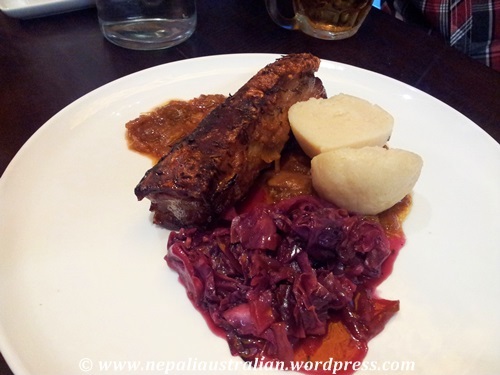 The items in the menu looked like genuine Czech cuisine and felt so familiar. 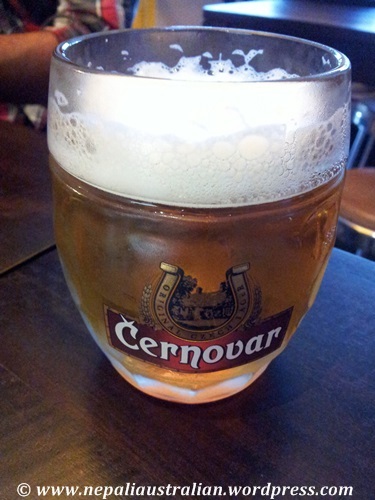 So first we ordered Czech beer for everyone and freshly squeezed orange juice for me. Everyone thought the beer was a bit light but they liked it. Then we had Pork Belly Roast (Beautiful succulent moist tender pork with light crisp crackling. Served with Czech potato dumplings & braised red cabbage), Farm White Rabbit Roast (Slow roasted rabbit on apples, garlic, onion & caraway seeds, served with Czech potato dumplings & green spinach puree and Marinated Chicken Breast & Mushrooms Linguine (White wine & creamy based served with mushrooms, shallot, onion, semi-dried tomatoes, parmesan & fresh basil). We all agreed that the food was just delicious. 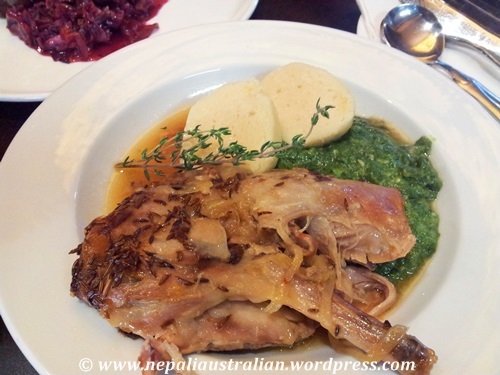 The rabbit was falling off the bone and the red cabbage was just the way I had eaten in Prague. It was the first time I had rabbit but I didn’t find it any different than chicken. 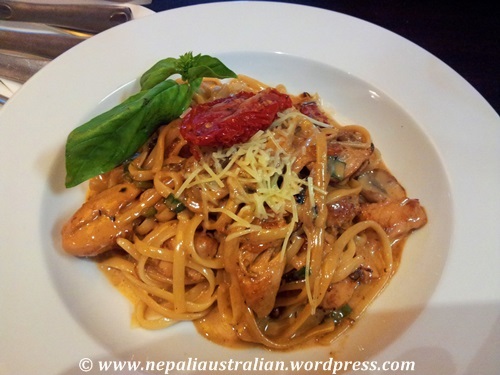 We loved the pork as it was well done with very crispy skin and linguine was rich and creamy. Overall one of the best meals we have had in a long time. They served fresh, simple, delicious food in a comfortable setting. We wanted to try their dessert as well but one of our friends was waiting for us in another café so we went there to have a coffee and cake. 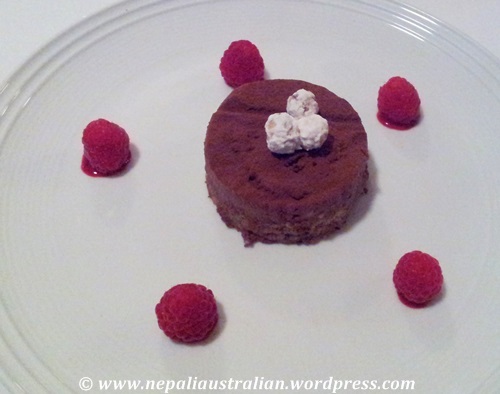 The chocolate mousse was just divine. This is continuation of my previous post. Please read the previous posts here, Part 1, Part 2, Part 3 and Part 4. Not surprisingly after my last email, most of my friends emailed me back except AS. They let me know that none of them were planning to come to Kathmandu as their circumstance was not good to take a holiday. I was a bit disheartened as I thought I might be lonely in Kathmandu. The friends who were already there would be very busy with their work and family. So the best person to give company will be someone on holiday just like me. My last hope was AS and was hoping at least we would have a week or so together before I left Kathmandu. In Kathmandu, my parents and family were busy searching for a guy for me. They were scared that I would change my mind again so they were sending information including photo of prospective husbands. I trusted my parents’ choices to find a guy from a reputable family which matched our caste and status but it was me who had to live with this guy for ever. Every time, they sent me a photo, I couldn’t see HUSBAND material in any of them. I started to question myself on what I really wanted from a husband. I was so unsure. I never talked to any of these guys because I didn’t think I should be the one initiating the communication. When my parents would say “Add him in Facebook or email the guy”, I would tell them if he is really interested, he should add me. I am not taking the first step. I think in a month, I heard about at least 10 guys and saw photos of a few of them as well. Now the conservation with my parents was more on what they were looking for in a guy and what I wanted. I used to tell them, you guys know better about what to look for as I didn’t have any specific list. The only think I told them was that I needed him to come to Australia after the wedding. As the days pass by, my parents became less excited about finding a guy as I kept on saying I didn’t like any of them. They though it would be better if I met few guys when I was in Nepal in December. So they stopped sending me the photos and details. AS; Doing gud. How are you? Me: Ya rite. Anyway just got off the phone with my parents. They are asking me what kind of man I want to get married to. They don’t know what to look for anymore as I kept on saying NO to everyone they showed me. Me: I am too scared to just say yes. I don’t even know these people. How can I marry anyone? AS; I have asked my mum to look for bride for me as well. I really don’t care. If they find someone good I will marry her. Me: Are you serious? Aren’t you worried that you won’t get along together and that will be a big problem in future. AS: It works both ways so I am cool. But it is funny, they haven’t found anyone yet. Me: So what kind of bride you looking for? Me: Come on, just give me a hint. AS: Someone who is educated, around my age and from Newar caste so my family will be happy. If it has to be arranged better make sure my family is happy. Me: So why couldn’t they find anyone yet then. Me: In fact I have a very good friend who is looking for guy as well. I think you will like her. The only problem is she is slightly older than you. (I am sure my friend will kill me if she ever found about this). But I am sure you will be good together. AS: I am OK with someone older but I am sure my family will not be OK with that. Me: Ohoo, that is sad. You guys would have been perfect. Anyway looks like we will be getting married soon. Imagine in few years if we meet again, with our partners and kids. God, life will be so different. AS; I thought u were already married before. Anyway what are you looking for in a groom. Me: I know it was fun to fool you :). I really don’t know. I am very confused. Me: Coz I have never been married before hahaha..Seriously I am not sure if I am really ready to get married. AS: I think no one is ever ready but you will be fine. 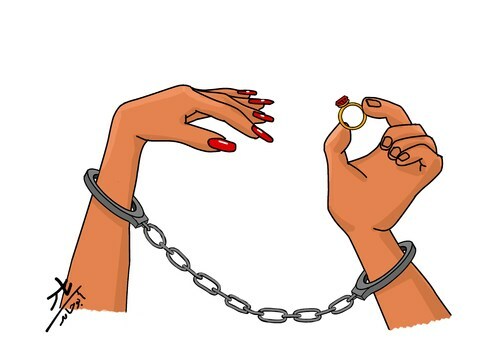 Me: What happens if I don’t get along with my husband? AS: You will be fine. Me: I am not sure what I want from life let alone have someone else with me to make it even more complicated. God why do we even have to get married? AS: So this world and the human race can go on. Imagine, if no one wanted to get married and have babies, what would happen. You are a nice gal so you will be OK don’t stress out a lot. Me: Ya right. 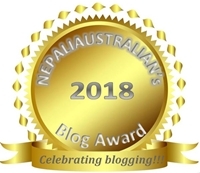 Are you coming to Kathmandu in December? AS: Not sure yet. Have to check if I can get time off from work. Also I plan to travel to some more places in the US before coming to Kathmandu so let’s see. AS: Will let you know the details once everything is fixed. Me: I am sure we won’t meet as always. Seriously I will be so bored in Kathmandu. AS: You have so many friends there and you know so many people. Me: Ya but they all will be busy in their work and family. It was the case last visit. AS: Time to go for lunch. Keep you posted. Me: Ok talk to you later. Enjoy lunch. After that conversation I met AS more on Facebook chat as well as Gmail chat. We used to talk about everything from our future plans to our future partners but we were still friends and just happy to be in touch. Life was going on as normal. I was really excited that my holiday was coming soon and was looking forward to that. In the meantime, AS decided that he would come to Nepal in January as well after his holiday to the east coast. That meant we might meet in Kathmandu depending on the flight he was able to book. But he was having problems booking a flight as it was holiday season and most flights were booked out. I was still very skeptical about our meeting. Finally it was December 9 and I was super excited to go home. I hadn’t been to Kathmandu for over 18 months. It was a change I was looking forward to. Also I kept my mind open about marriage and prospective groom. Before I headed to airport, I checked my mail for the last time and there I had an email from AS. You have a safe journey now, Bon Voyage! Have fun! We will meet when we meet! I didn’t feel like replying to the email at the last minute so I closed my laptop and made sure everything was in order before I left for the airport. I took a cab, checked in and cleared immigration. This time I was flying Singapore airlines. I waited outside the boarding gate. I wished I was not traveling alone especially of the 9 hours transit time I had in Singapore before I flew to Kathmandu. But I tried my best to think about my plans in Kathmandu. 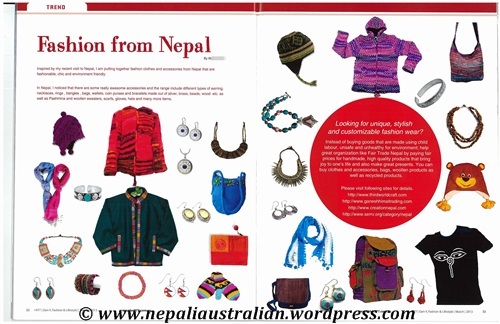 This article was published in +977 (a Nepalese Lifestyle Magazine in Australia) in March 2013 issue. Inspired by my recent visit to Nepal, I am putting together fashion clothes and accessories from Nepal that are fashionable, chic and environment friendly. 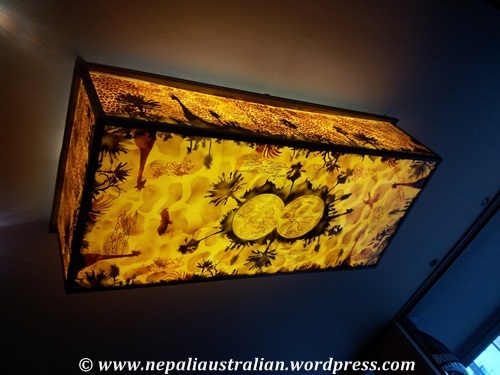 In Nepal, I noticed that there are some really awesome accessories and the range include different types of earring, necklaces, rings , bangles , bags, wallets, coin purses and bracelets made out of sliver, brass, beads, wood etc. as well as Pashmina and woollen sweaters, scarfs, gloves, hats and many more items. Looking for unique, stylish and customizable fashion wear? Instead of buying goods that are made using child labour, unsafe and unhealthy for environment; help great organization like Fair Trade Nepal by paying fair prices for handmade, high quality products that bring joy to one’s life and also make great presents. You can buy clothes and accessories, bags, swollen products as well as recycled products. Please visit following sites for details. We have all heard about Paradise but we have never seen it. Today I am happy to announce that I have been there and it is called Pokhara, 200 km away from Kathmandu, capital of Nepal. Pokhara is heaven for domestic and international tourists with its luscious green hills, snow-capped mountains and beautiful lakes. These days Pokhara is also famous for its various adventures like paragliding, gliding, ultra-light flight and zip fly. I have been waiting to sky dive for ages so I thought paragliding would be a great step towards it. So when I went to Nepal this year, I went to Pokhara where I saw the paradise from a bird’s eye view with the magnificent mountains up close. We booked the paragliding through the hotel. So the company picked us up at the hotel. Initially, it was only me and my husband who were planning to glide but my mother in law also joined us for the flight once we asked her. They took us to their office first where we filled out forms and signed a no liability statement. From there we were off to Sarankot, which was around 30 minutes’ drive from the office. The drive was a bit bumpy at times but the driver was giving us lots of information about the paragliding. He told us that even an 80 year old man had done the paragliding from their company. Once the jeep stopped, we had to walk a few minutes to reach the top of the hill where I saw many gliders were already taking off from the mountain and floating away. We were each assigned a pilot and I got Vlad from Serbia. He has been flying for over 10 years all over the world and seemed well trained. He buckled me up with the gears and a few instructions on how to take off. With a little bit of fear and a whole lot of excitement, I was ready for my flight. After checking all the equipment and wind flow we ran together to take off. I was quite surprised how easy that take off was as we glided off the cliff and I naturally fell back onto the seat and began drifting peacefully. It was great to realise that I was in the air flying. I was already high up on the sky when I saw my husband and mother in law taking off from the hill. Once in the sky, I could see lots of colourful gliders filling the blue sky on the sunny winter day. I could see eagles circling below us as well. The pilot informed me that we were cruising above 8000 feet in the air and I could see the magnificent view of the Himalayas, hills with pockets of green forests, beautiful lakes and Pokhara city. As we climbed higher, the view of Dhaulagiri, Annapurna, and Manasulu were so close and breathtaking. We cruised for almost 20 minutes while the pilot pointed out a few places. Also it was fun trying to find my husband and mother in law among many gliders as we could hardly recognise any face from so far away. As the flight was smooth, I asked the pilot if I can take my own camera from my pocket. He said it would be fine so I took my camera out and took a video and photos of our flight. After a while the pilot asked if I was ok to do some acrobatics in the air. I was scared but I said yes so he let me hold his camera as he prepared for some spinning and spiralling. I put my own camera back in my pocket and we did some acrobatics over the lake swinging back and forth and dropping in the air. It was such an adrenalin rush and I would have liked him to keep going but it was almost time for us to descend and land next to Fewa Lake. He asked me to put my foot up and not try to touch the ground when we landed so I did as I was told and I was safely on the ground. My husband and mother in law had already landed and we all were very happy with the experience. Once they packed the equipment, we were back in the jeep on the way to their office where we waited for our photos and video. They also gave us certificates for the flight! All the cooking shows on TV inspired me to cook something new the other night. 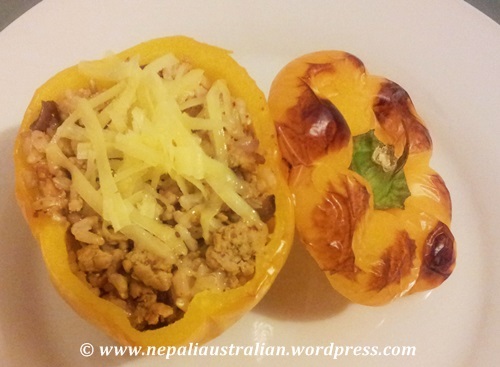 It was stuffed capsicum and it turned out so yummy. Here’s the recipe. 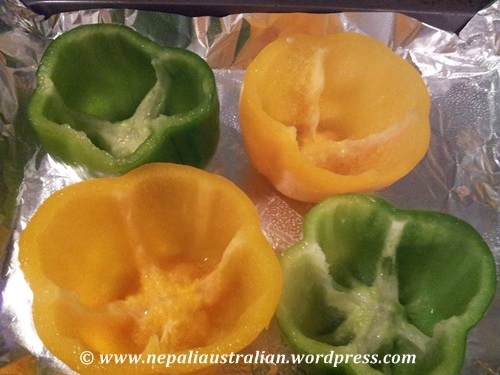 Slice tops off capsicums to make lids. Scoop out seeds and membranes and discard them. 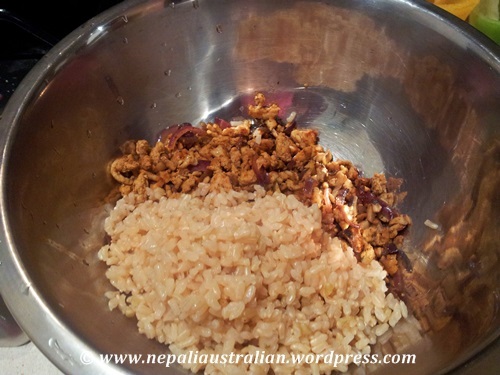 Cook rice in a rice cooker using 1 cup of water and 1 cup of chicken stock. Heat oil in a wok over medium heat. Add turmeric powder. Add onionand garlic. Sauté 2 minutes. 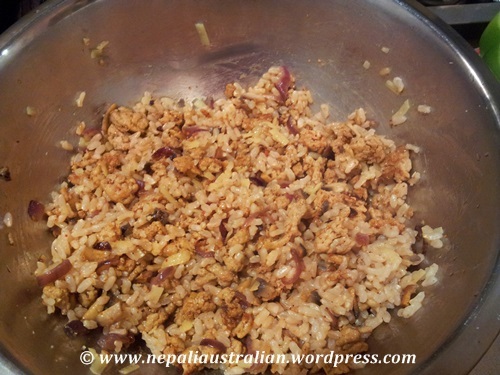 In a bowl mix the cooked chicken and rice. Add half of the shredded cheese. 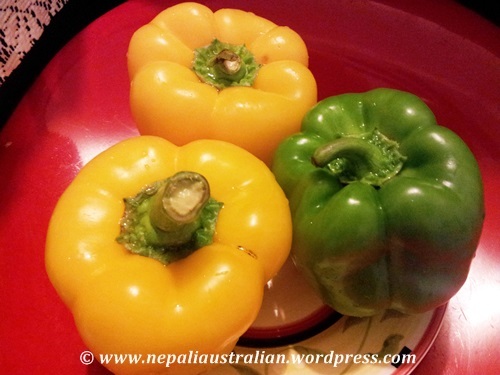 Fill each capsicum with the mixture. Place upright in a shallow baking dish. 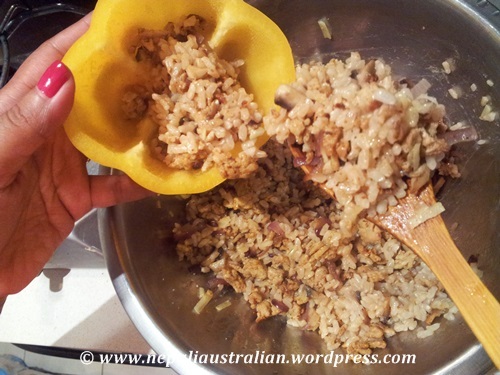 Cover with capsicum lids. 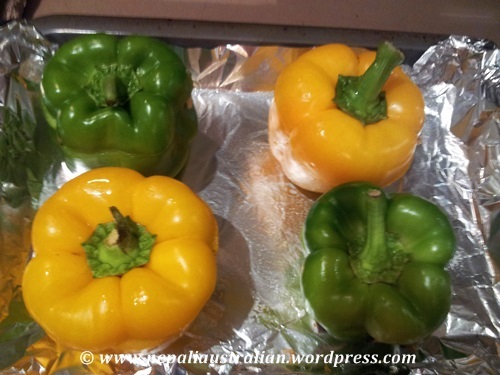 Cover the dish with foil and bake for 25 minutes or until the capsicums are tender. 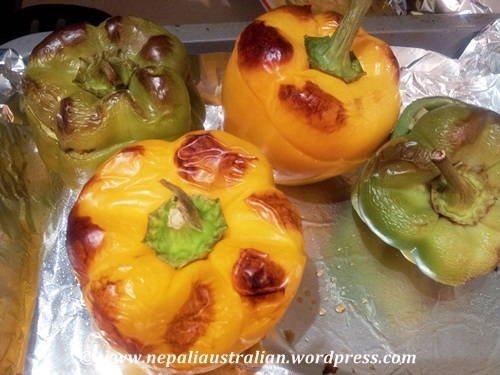 Open the lid and top the capsicum fillings with the remaining cheese. Close lids. This is a continuation of my previous post. Please read the previous post here, Part 1, Part 2 and Part 3. Normally I used to send emails to my friends from time to time just to say hi and keep in touch. So I sent the following email to AS one day. I didn’t expect a reply from him at that point. I already knew that it was normal not to hear from him for quite some time. Just dropped in to say hi. So have you made you plans about the future there? Also what time u are online these days. BTW when r u going to Nepal? It took him another 3 weeks to email back as expected. Things have been a little crazy here so haven’t been online. I will be here till December or Jan then may go to Nepal. I haven’t been online much lately but will be till 1 or 2 in the night here PST. The timing between Australia and USA is so messed up and I can’t access messenger at work so I don’t know how to meet u online… gotta think of some way. 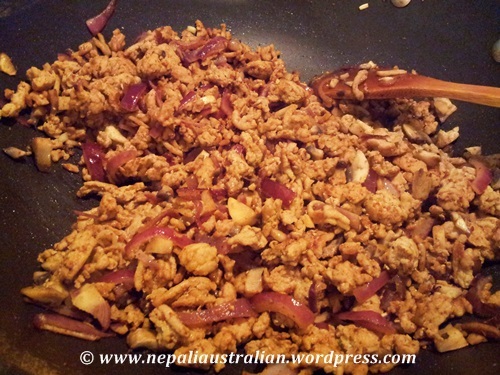 Anyways… I’ll only go to Nepal when I finish here. Been too long. And hopefully it’ll be the same time as u. so when’re u going btw? Ok do write to this infrequent correspondent 🙂 even though u may want to bash me. It took me 2 weeks to write back to him because there was a lot going in my life then. I was thinking to go to US on a working holiday visa. My parents wanted me to come to Nepal and decide on getting married. I was looking for another job in Sydney. So I decided not to go to US as the economy there was not doing great. Instead I decided to go to Nepal and visit my family. Also one of my good friends was in Hawaii so decided I will visit her and then go to Nepal.I was also applying for new jobs, making me very busy. Finally I decided to reply to AS with my plan. I am thinking if I have chance I will go to Hawaii for a week before going to Nepal in Dec.
Do let me know if u can come too. I have my frd there and also AH is there. Around that time I was keen on finding a better job and it was really making me frustrated. I did look around a lot but there were not many jobs that I wanted on the market. One of the weekends, I was home online doing different things like looking for jobs, checking Facebook and so on. I had plans with my friends, brother and SIL to go clubbing that night. It was evening already so I started getting ready. While I was getting ready, I heard a “tring”, a message in my Facebook chat. When I finished what I was doing I went and check what it was. SUPRISE SURPRISE. It was AS saying hello in Facebook chat. I was about to go out in 30 mins so I did not know if I should response or not. I decided to say a quick hi. AS: Hey. am good. How r u? Me: I am sorry but I am about to go out so can’t chat as I am getting ready. Me: if you have Skype add me. My id is XXXXXXXX . I can talk and get ready if you have time. He sent me the request and I added him. Now we were voice Skyping while I was getting ready to go out. AS: Do you have camera in your laptop. Me: Of course. Here you go, I started the video chat. Hellooo, can you see me? He had his video on as well. AS: I can see you. Ok enjoy your night. Me: Of course I will. We are going clubbing. Dancing always makes me happy. I shut down the laptop and went out. I had a great night with my brother, SIL and my friends. We went to city and it was beautiful weather. As usual we had our dinner and danced till late. It was Saturday night so we had lots of fun. My life was moving as normal. I had decided that I was definitely going to Nepal in December as I desperately needed a break from everything in Sydney. One of the reason I had been delaying my trip home was because my parents really wanted me to think about marriage. As I was far away it was easy for me to ignore them but when I would be in Kathmandu I knew that I would be forced to take a definite step. Till then I was telling my parents I was too young and not ready. That month one of my cousins who was just a few months older than me got married. After the wedding ceremony was over, the only topic my parents could think of when I called was about my marriage. To get them off my back I told them to start looking for a guy for me. I had no intention of getting married soon but if my parents were happy to look for someone for me, I thought I will let them do that. I can always say no to anyone they showed me anyway. I know it sounds so evil but that is what I did. After making those decisions I wrote to AS and a few of my other friends letting them know that I was going to Kathmandu in December. Let me know if any of u are coming to Kathmandu the same. If possible try to come so it can be reunion for all of us. This is continuation of my previous post. Please read the previous post here, Part 1 and Part 2. AS was really nice and I was glad for his company during the 12 hours at LA airport. Without his company, 12 hours in LA would have been hell. I really don’t know what I had been thinking while booking that flight. But my friend in Florida had told me to book an early flight to LA just in case there were some changes in my domestic flight schedule since, he said that it was normal for domestic flights to get cancelled or delayed and he didn’t want me to miss my flight to Sydney. So AS being there at the airport was a blessing for me (in more ways than I knew at that time) and it was great to catch up with an old friend. It was a really long flight back to Sydney. I was so tired that I think I slept for more than 10 hours out of 16 hours flight time. During my stay in US, I flew and travelled between different states so many times that I hadn’t had a proper night of sleep for weeks. Staying in new places every few days didn’t help either. So resting during the flight back to Sydney seemed like the best idea. I woke up a few times during the flight for food and to go to the loo, other than that I just rested. It didn’t feel like I was in a plane for 16 hours when the pilot announced to fasten the seat belts for landing. Finally when I landed in Sydney airport, I felt like I was home again. It is always nice to be back in familiar surroundings after a long holiday. 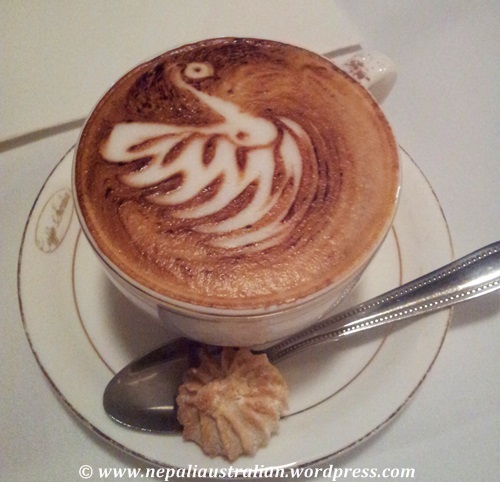 It was Monday 8 am Sydney time, a winter morning. I was sure my body was still on US time making me sleepy and tired. But I had promised my boss that I would be back at work the same day. I used to teach in a University those days and it was important that I didn’t miss the classes. I really don’t know what I was thinking. I thought I would enjoy as much time as possible in US so booked the last flight out of the country. Anyway I caught a cab home, had a shower, changed into a fresh outfit and went to work. I was still very tired but I made through the day. I don’t remember much but I was glad when I finished for the day. When I returned home that night, I just slept like a baby for the next 12 hours. I went to work the next day as well. I was still tired but started showing symptoms of flu. It was summer in US and when I came back to Sydney, it was winter. My body was having a hard time adjusting. I am sure my holiday in US had been really hectic. I fell really sick by Wednesday that I couldn’t go to work. It really scared me when I started sneezing and coughing really bad and had high fever. I wished my mum was there to look after me. I felt so alone and lonely. It is what happens when you stay so far away from your parents that they can’t be there when you need them the most. 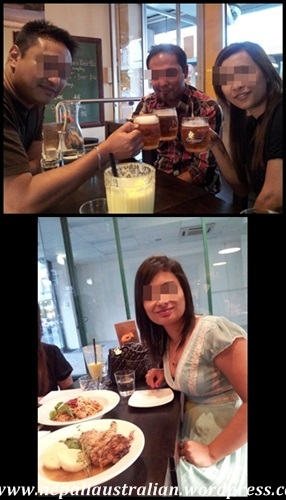 My brother and SIL were there but in the afternoon they had to go to work leaving me alone at home. Around that time Swine flu was spreading around the world and US was one of the major places where it was reported. 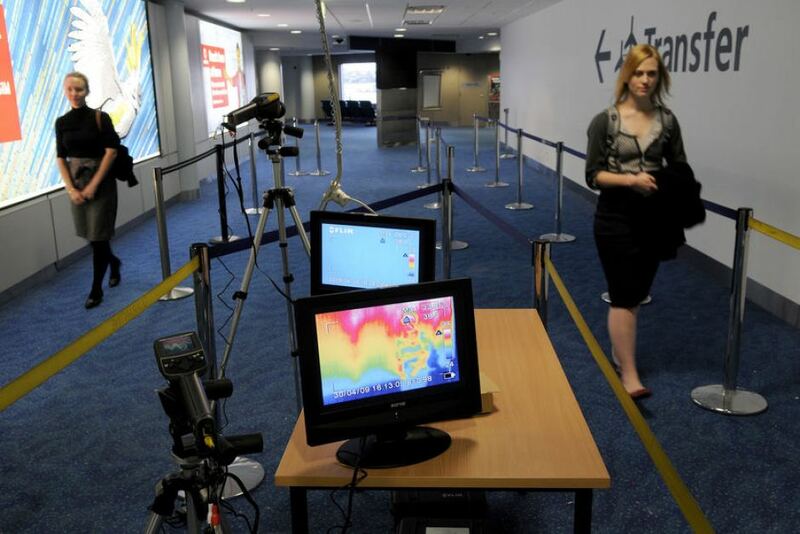 Sydney airport had thermal imaging to check for flu fevers (heat) installed so it was definitely very serious. When my fever didn’t go down even after 2 days I went and saw the doctor and following conversation occurred. Doctor: What’s wrong with you? Me: I have flu, cough and high fever. Doctor: From when you started feeling sick. Me: It started from last 3 days but I have to tell you that I have just come back from USA. 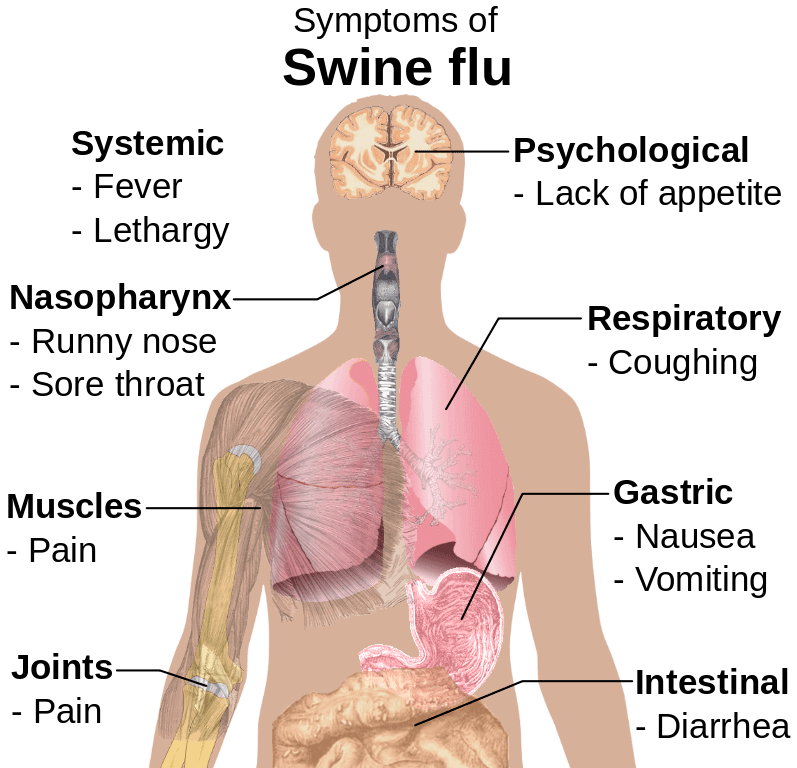 I am really scared that it might be Swine flu as I have all the symptoms. Doctor: I will ignore what you said last because if I determine that it is Swine flu, I have to inform Department of Health. Then they will take you away for quarantine and you may be under their observation for months. So we will treat this as normal flu. Let’s see how we go. I was really scared after hearing that from the doctor. I bought all the medicines he prescribed and went back home. I still had high fever and was so tired that I was in bed for a whole week. First few days, I couldn’t do much so I was not using internet at all. But on the 4th day when I opened my laptop finally, I saw a friend request from AS in my Facebook. I couldn’t believe my eyes that he had also sent me an email. It was definitely something I was not expecting but felt good to read his email. Hindus normally pray to God Ganesh before starting something new. So it was a humours way of AS to have a subject as Shree Ganesh after he opened a Facebook account. He definitely made me laugh. And I was glad that he created a Facebook account so we could keep in touch more. He had sent that email two days ago so I replied him straight away. We didn’t take many pics but still gud memories with few pics. Thanks you once again for your company. It was fun. For now I am still adjusting my life here and fixing my new place. Bit sick for last few days. I went and checked his Facebook and it had one photo on it. It was a close up shot of him in dark blue t-shirt smiling at the camera. After this exchange of emails, I didn’t hear from him for a couple of months (no surprise). I got better and thanked god it was not Swine flu. The job was hectic so was my social life which kept me busy. When I had free time, I went through my photos from US. It was nice to remember a great holiday I had in US.I selected a few and uploaded them in Facebook to share with my friends and family. I uploaded a few pictures I had with AS and tagged him. I hoped he checked his Facebook. He was MIA again. I never saw him online in Facebook or messenger and he never had any activities in his Facebook either.